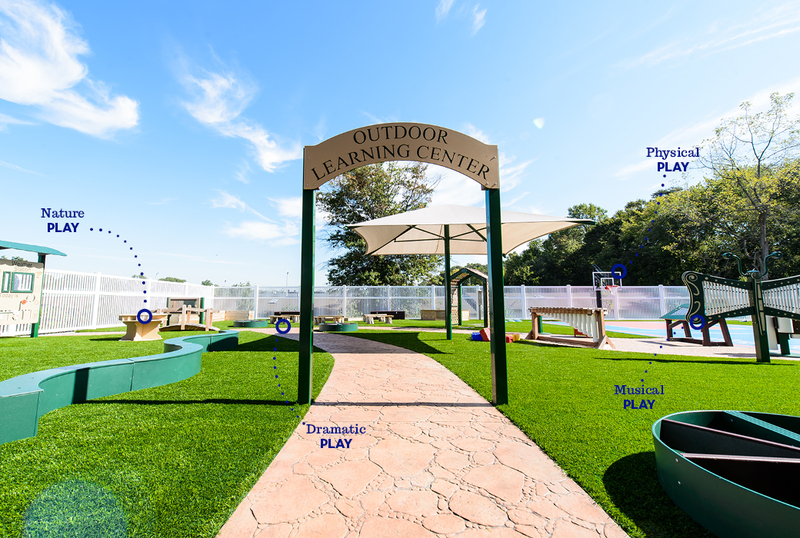 We at Grounds For Play support the major types of play with our industry-leading educational play environments. The types of play include physical, dramatic, sensory, nature, music and art, and age-appropriate play. Children need the various types of play in order to support and facilitate meaningful learning opportunities as they develop language, motor, social, emotional, and cognitive abilities. The effects of these developments are seen in the classroom with better academic performance and improved concentration. Movement play, primarily found in physical play, helps to strengthen the body and develop gross motor skills. Physical play also allows for learning opportunities in adaptability, flexibility, and resistance. Physical play allows for children to reach important developmental milestones as they age including hand-eye coordination, muscle development, climbing, body position, coordination, balance, and fine and gross motor skills. Grounds For Play “sets the stage” for dramatic play through our many products that encourage and inspire children to act out stories and create narratives with other children. By doing so, they are able to make sense of their surroundings while developing communication skills, sharing, creativity, and emotional development. While “playing pretend” may seem like an insignificant form of play, it is an essential part of a child’s daily curriculum. Dramatic play provides children with the opportunity to work through emotions, develop and learn important social skills, and develop expressive language. The effects are seen in the classroom as research shows there’s a correlation between dramatic play and better literacy and reading skills. From infants and toddlers to school-agers, children develop important sensory abilities including sight, smell, touch, hearing, and taste as they play. No matter if it's dramatic, physical, musical, or nature play, all forms of play include sensory input. It’s important to provide your play environment with a diversity of play equipment to help children explore their different sensory skills. For example, our Sand and Water Station provides children with a tactile, auditory, kinesthetic, and visual learning opportunities as they explore qualities and attributes of liquids and solids. Nature play gives children the opportunity to explore and understand nature. From watching worms in the soil to balancing on a log, nature play is child-initiated and child-directed. Research shows that children benefit greatly from daily connections with nature. The use of nature-based products in our play environments allow children to learn and develop responsibility as they care for plants and experience the natural world. Just like a classroom is carefully prepared by a teacher for learning, an outdoor play environment is carefully designed, beckoning the child’s innate desire to learn and explore. From the entrance and pathways to the choice of play equipment, each element is purposely selected and placed in a cohesive design that allows for multiple opportunities of learning. When allowed to create, whether that be music play or an art piece, children can access their playfulness, creativity, and innovative spirits. Allowing children to express and develop their creativity is important to their growth and development. Art and music play enhance play environments by expanding the ways children can learn and explore their creativity in the world. Research shows the arts are critical in helping children develop self-expression and creativity. Art and music play also help to improve memory and brain power. Additionally, children develop a wider vocabulary as they express their ideas behind the art they create. It’s important to provide outdoor play opportunities for children that are age-appropriate. Age-appropriate play is central to children’s overall development. It focuses on the developmental ages and the general guidelines for safe, appropriate, and stimulating play equipment. You simply can’t expect a 1-year-old to safely play on climbers for a 4-year-old, much less for a 12-year-old! Age-appropriate play equipment gives children of all ages a fun and safe place to play and learn. Grounds For Play is at the very heart of age-appropriate opportunities through our materials, equipment, and play opportunities we provide for infants, toddlers, preschoolers, and school-age children. From toddler playgrounds for younger children to more challenging structures for older children, we can help design an age-appropriate play environment for your space.